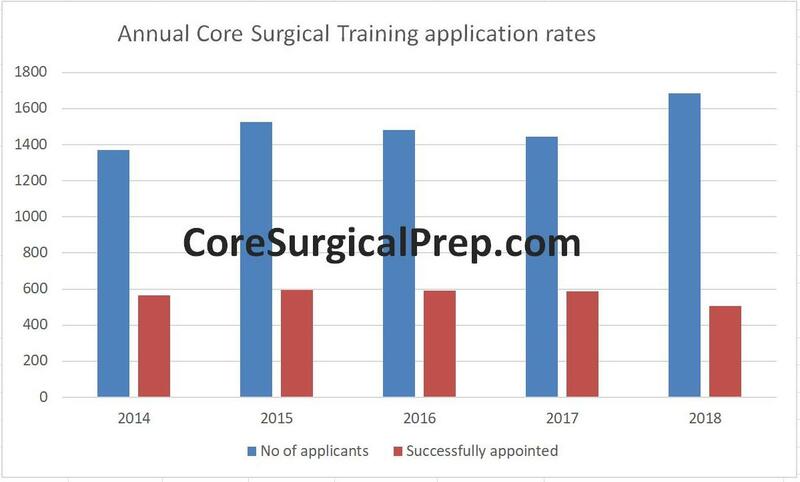 In 2018 the Core Surgical Training competition ratio for the UK was 3.3:1. This means that for every 3.3 applicants, 1 was successfully appointed to a Core Surgical Training post. 85% of those that applied were invited to interview and 35% of those interviewed were successfully appointed. There are between 500 and 600 Core Surgical Training (CST) posts available each year and this number can change considerably each year. These jobs are divided up according to deaneries. Below summarises the Core Surgical Training Competition Ratios over the last few years and the number of jobs advertised. These competition rates do not refer to the likelihood of being offered a job in your first choice deanery. Because certain deaneries are more competitive, applicants looking to secure jobs there will need to ensure that they score highly at the interview stage. Sign up now now for access to the full Core Prep Question Bank. To sign up to the CoreSurgicalPrep mailing list and be the first to hear about updates for the 2020 application and interview round, click here. Click here to sign up to the CorePrep mailing list. Considering specialising in Orthopaedic Surgery? Have a friend or colleague preparing for their ST3 Orthopaedic Interview?